Zoned Future Development. Dorchester offers quieter community living just outside London to the east with all the amenities and facilities that are needed for convenience of urban living. These parcels are adjacent to the subdivision of Tiner Estates on Mill Pond right in the town of Dorchester. Easy access to 401, 402 and 403 highways. Excellent Investment Land. Previously a tobacco farm with sandy soils. Currently rented to neighbouring farmer. is 56.343 acres. 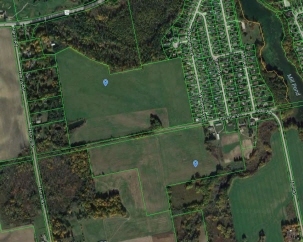 CON B farm is 44.197 acres with a sale being subject to a severance of approx. 1 acres including house and buildings. Both farms are available separately. CON A $1,960,000 and CON B $1,155,000.